A house concert is a concert hosted in a private space (a house, apartment or community room are all common venues) as opposed to being held in a normal public venue (a bar or coffeehouse). Beyond that broad distinction, there are no hard rules for what constitutes a house concert. These events are fun, memorable and a growing national trend. American Airlines and CNN have both done stories about it. Curious to learn more? We love to create music in an intimate environment for you and your friends, so please contact us if you are interested in learning more. We can compare calendars and decide when Ginny can be in your area. Depending on the available space (and comfort level of the host), house concerts vary quite a bit in size and scope, from a dozen people in a small living room, 30 people in a Yoga studio, 50 people in a basement, or 250 people in a large backyard. 40 people in a medium-to-large living room is about average. You do want to make sure there is adequate seating for your guests – whether that means gathering all the chairs from around your house, renting or buying folding chairs, or asking guests to bring lawn or folding chairs, cushions and blankets. Often, house concerts are BYOB and involve a pot-luck dinner or hors d’oeuvres. There is usually 30-60 minutes between when doors open and when the music starts. This allows for quick catching up with friends, noshing, and pouring + sipping of wine! When there is a critical mass in attendance, or when “start time” rolls around, the concert begins. Ginny usually plays two 45-minute sets with a short refreshment break in the middle. But shorter or longer sets are easily accommodated as well. She is happy to play whichever of her songs you’d like to hear most (provided she remembers how to play them!). Here’s what is wonderful and unique about house concerts: there’s no vast separation dividing the artist from the audience. Everyone is in the same room together – sharing, listening, connecting. There are certain songs thatonly work in this sort of setting, as well as a bunch of stories behind the songs artists are only comfortable sharing in this intimate sort of setting. In general, there’s something very real and tangible and human about the whole set-up that can be very moving and touching, inspiring and invigorating. And that goes for the performers as much as for any listener. Perhaps even more so. 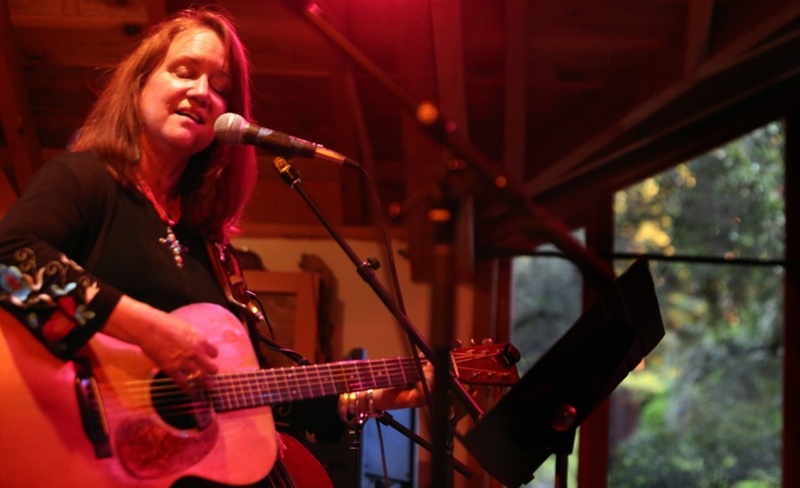 Enthusiastic word of mouth is by far the most effective way to get folks to come to a house concert you are hosting. Share CDs with your friends, talk up the event and the experience of her quirky humor, and urge folks to visit BettySoo’s website to check out the tunes. We have plenty of promotional materials available (photos, quotes, and other stuff – even a pretty e-flyer you can download! – in the Discover section of the site) to help you put together an enticing invitation to send or e-mail to your friends and family and co-workers. If you’re excited about the house concert, spread that excitement among your friends. They’ll be intrigued. It’s our job to win them over once they’re there — it’s your job to make them curious enough to give the house concert experience a try. One note: it’s important to make sure, in the promotional process, that your guests understand that this will be a house concert, not a house party that has some music going on in the background. It’s usually a good idea to have an RSVP system in place to get some idea of how many folks to expect – especially if there’s a second tier of people you’d like to invite. Some folks use Facebook events, Paperless Post, Evite.com, or other invitation sites to keep track of their guest list. That seems to be a pretty good system. Also, unless you’re uncomfortable with it, we will post the house concert date on our website schedule (we do not publish private street addresses unless given permission) and ask that people interested in attending contact the host via e-mail (or your preferred method of contact) for more specific details and to RSVP. This way, you maintain control over to whom you are opening your home and how many people you’re inviting in through your front door. Typically, the host collects a suggested donation from the guests, either at the door (upon entry) or during the break. Many house concerts require payment in advance – either at a previous concert or via paypal or a check in the mail. This helps when many people reserve a seat but don’t attend. The host and/or artist can’t be expected to fill those seats at the last moment – but they often would have been able to “sell the seats” if they weren’t already reserved. The suggested amount ranges from between $10 to $25 per person, with $15 or $20 being pretty typical. We tend to leave it up to the host (since you know the invitee list and the local market) to know much is an appropriate amount to ask of the concert attendees. We will never begrudge any guests who are unable, or choose not to, contribute. We know that at times, it seems it will be awkward to be explicit about money with your guests, but we’ve found it’s best to just be as up-front and clear as possible from the start – everyone seems to receive it just fine. It is actually much less awkward when guests know what to expect from the start. For instance, state it from the beginning (in invitations, etc) that there’s an expectation money will be involved in a more formal way than “passing the hat to help pay for gas.” Having the money basket at the door is a good idea, and it actually seems to make things less awkward. I’ve performed at several concerts where children or young adults were put in charge of collecting donations – this seems to ease the tension, and from what I’ve seen, they have fun doing it. We don’t always ask house concert hosts for a guaranteed minimum, but we sometimes do – depending on travel or risk involved. In any case, it’s a really good idea to discuss with us if you think the attendance will be fewer than 15 people, as that may help us to decide what other gigs we may or may not need to accept on that leg of a tour. Thank you for considering hosting a house concert. Whether you’re still interested (or not) or able to host one, we highly recommend that you keep your eyes open for house concerts of your favorite artists. Go attend some of them! We think you’ll enjoy the experience.